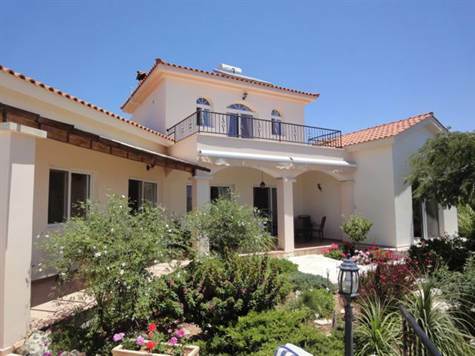 Peyia, Paphos - This detached custom built home is situated in a quiet residential area of Peyia, a few minute’s drive from Peyia village and the popular resort of Coral Bay. A large master bedroom with fitted wardrobes. En-suite shower room with vanity unit. Two large balconies with stunning rural and sea views. External staircase to the mature landscaped gardens below. The property is in excellent condition with modern finishes. It is ideal as a permanent residence or as a holiday home and has title deeds. Furniture is negotiable. Please refer to MLS #: 1349 when inquiring.